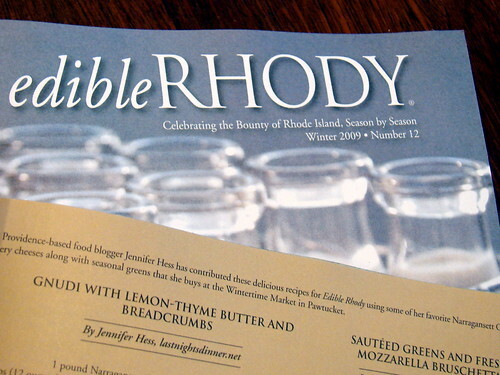 My husband‘s not the only one who appears in the Winter 2009 issue of Edible Rhody – I was delighted to provide two recipes for inclusion in the issue. If you’re local, it’s on newsstands now. This is so great Jennifer! I need to try to find a copy up here on the north shore. Recipes look absolutely delicious too. I read your tomato soup post and am commenting here. Congrats on your recipes in the magazine! Hang in there with your sweet kitty-that is so hard. It is such a pleasure for me to join you every week in your culinary adventures, so don’t lose your mojo. You Rock! And, you are so lucky to have so much great stuff in RI. In Augusta, Ga., the best I can do is a CSA (thankfully it is quite good) and one Earthfare market…so no locally raised meats, etc. Hope you have a great week. If you go to my blog, please comment. It is slow getting followers (as I’m sure you know) and I’d love to hear from you. Great magazines and great blog!